The Linksys Smart Wi-Fi is a free service that allows you to access your router, configure and check your home network instantly from wherever you are. To take advantage of the Linksys Smart Wi-Fi Tools on your Linksys Smart Wi-Fi Router with classic view, you need to perform a firmware upgrade. Your router is capable of either automatic or manual firmware upgrade. When you decide to do the manual upgrade, you have to download the firmware first from the Linksys Support Site. See the instructions below to understand and learn how to do this. Before you start the upgrade, check if your router has a USB storage port. If it has, then make sure that no device (e.g. printer, hard drive) is connected to it before you start the process. Go to the support page of your device to download the Linksys Smart Wi-Fi Firmware. QUICK TIP: You can click on the corresponding links to visit the support pages of each product. Scroll down to the DOWNLOADS / FIRMWARE section then click Download Software. Click the hardware version of your device. 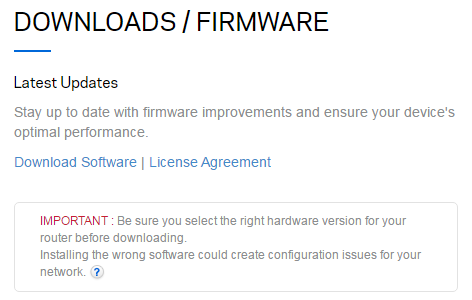 Select the firmware for your device and click Download. Locate the file you downloaded. Right-click on it then, click Extract Here. The extracted firmware will show on the folder. Open a browser and log in to the router's web-based setup page by entering "192.168.1.1" in the Address bar. The default username and password is "admin". NOTE: If you changed your password, used that instead. Click Administration then click Firmware Upgrade. Select Manual Upgrade and click the Browse… button. Select the file that you extracted then click Open. A warning prompt stating Upgrade must NOT be interrupted!! will appear. Once the upgrade is completed, a system reboot message will be displayed. Wait until the Power light of the router appears solid. Log back in to your router’s web-based setup page by entering the router’s IP Address. You will be redirected to a Sign In page. If you already created a Linksys cloud account, enter your login credentials in the Email Address and Password fields and click Sign in. 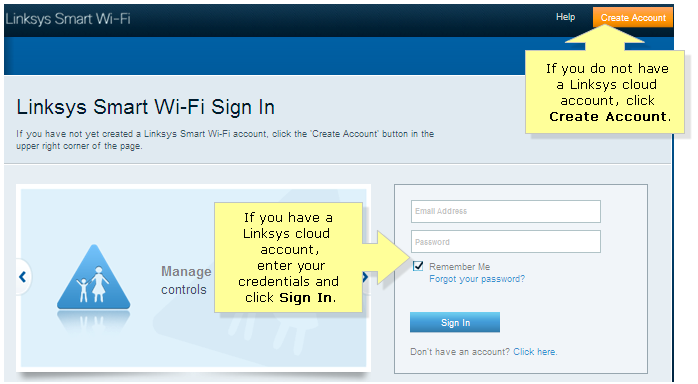 If you do not have a Linksys cloud account yet, click on Create Account then follow the step-by-step instructions. After logging in using your Linksys cloud account, you will be prompted to associate your router to your account. You will need to enter your router’s admin password. The default is admin. You can only associate your router within the same network (from behind the router either wired or wireless). You will only be prompted to associate your router the first time you log in with your cloud account so long as the router has Internet connectivity. Once you have associated your router, any future logins will require your cloud email address and password when the router is online; this is considered a single sign-on. If your router has no Internet connectivity you will be prompted to enter the router’s admin password, once the Internet has been restored you can continue to use your single sign-on cloud account. Log in to the router’s web-based setup page by entering "192.168.1.1" or "myrouter.local" in the Address bar or go to https://linksyssmartwifi.com and enter your Linksys cloud account credentials. On the Linksys Smart Wi-Fi page, click Connectivity. On the Basic tab, click the Automatic box to uncheck then click Ok.